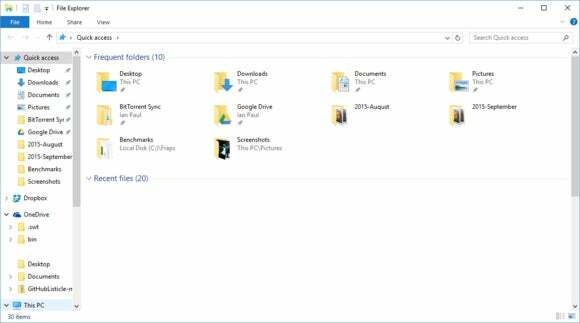 File Explorer's Manage tab for photos has some quick-and-easy photo-management tools for Windows 8 and Windows 10 users. Believe it or not, File Explorer has a few handy image tools that can make your life easier. They’re nothing exciting—we’re not talking about hidden image-editing here. Nevertheless, these tools are helpful to know about in a pinch. All three of these tools exist under the Manage tab when you open a folder in File Explorer that contains images. The Manage tab will not appear if you’re looking at a folder with just documents or other file types. These features are available on Windows 8 and up. File Explorer’s Manage tab for photos. The first feature is the ability to quickly start a slideshow. Open your folder of choice containing photos. Then click the Manage tab and select Slideshow from the various options. A slideshow will start that includes all the photos contained in the folder. Check out our earlier look at this feature for ways you can speed up and slow down the slideshow. There are several ways you can set an image as your desktop background, here’s one more. Again under the Manage tab, select the image you want to set as your wallpaper, and then click the Set as background option. This will set that image as your background across all monitors. Check out our earlier tutorial if you want to have a different wallpaper on separate monitors. One last feature under Manage is the ability to rotate photos. There are two options: Rotate left and Rotate right. Select the file you want to rotate, and then select the desired option. Rotating often comes in handy with photos imported from a smartphone or camera that have an incorrect orientation.